Foreign visitor arrivals in Korea last year exceeded 6 million for the first time. The new record was set on the last day of the year with the 6 millionth foreigner, a Chinese businessman, greeted at Incheon International Airport with a commemoration plaque, as well as free airline tickets and a hotel voucher given by the Korean National Tourism Organization (KNTO). The number of visitors to the country has been on a sharp rise over the past few years, marking a 22 percent increase in 2004 to 5.82 million from a year before, thanks to a surge in the popularity of Korean pop culture among Asian nations. On average 15,000 to 20,000 foreign visitors are coming to Korea every day. The official said the daily number of foreigners is expected to increase over the next few months due to soaring levels of visitors from Southeast Asian nations heading to the country's ski resorts. The frequent confusion between the two WTOs - World Tourism Organization and the Geneva-based World Trade Organization - officially ended when the General Assembly approved to add the letters UN (for United Nations) to the start of abbreviation of the leading international tourism body in English and in Russian. The problem - especially for the media - arose when the name World Trade Organization was adopted and with it the abbreviation WTO in English, a problem that did not arise in other languages where 'trade' translated as 'commerce' and it became the OMC. Although the World Trade Organization also belongs to the United Nations system it is only a 'related agency', the same status held by the World Tourism Organization before becoming a specialized agency. UNWTO abbreviation remains OMT in French and Spanish. UNWTO General Assembly will conclude its work at its 16th session in Dakar, Senegal, on Dec.2. In the meantime, the General Assembly re-elected Francesco Frangialli to the post of WTO Secretary-General from 1 January 2006 until the end of 2009 .Mr. Frangialli was re-elected by 85 votes to 14. Mr. Frangialli joined WTO as Deputy Secretary-General in 1990 and succeeded Antonio Enriquez Savignac ad interim from September 1996 before being elected Secretary-General in 1997. He was re-elected in 2001 for the years 2002-2005. Korea and Japan have agreed to increase both air passenger and cargo services between the two neighboring countries this year to meet the growing two-way air traffic. According to the agreement signed at the bilateral aviation talks held on December 23, 2005, frequencies of passenger and cargo flights will be increased by 18.5 percent and 21.3 percent respectively. Accordingly, the two more services connecting Seoul with Hokkaido region will be introduced making it easier for Korean travelers to visit Hokkaido, the second largest and northernmost of Japan's four main islands. With its unspoiled nature, Hokkaido attracts many outdoor lovers, including skiers and snowboarders in the colder seasons and hikers, cyclists and campers from June to September. At the same time, three to four times a week air service on Seoul-Asahikawa and Seoul-Hakodade will also be introduced. Among the major Japanese destinations to which more flights will be made available from Seoul, Busan, Jeju, Daegu, Kwangju and Chongju are Sapporo, Hiroshima, Osaka, Nagoya, Toyama and Okinawa. The two counties also agreed on granting code sharing to the third air carrier without limit from the current restrictions on 21 times. On year after the devastating tsunami, life is coming back to Phuket with return of tourists to about 70 percent of pre- catastrophe numbers, according to Udomsak Usawarangura, mayor of Phuket. Tourists sunbath, swim and jog along the main beach of Thailand's biggest resort island. Market watchers expect Thai to conclude this year with 11.5 million tourists or 2 percent less than in 2004. One major factor behind the sustained growth of Korean tourists to Phuket is charter service introduced by Orient Thai Air since February only a couple of months after the devastating tsunami, said a market watcher. As far as safety is concerned, there would be no problem thanks to introduction of early warning system for the tsunami, he said. Phuket landscape is also changing one year after tsunami. New tourism complex is now under construction in the eastern part of Phuket where more fashionable resorts, shopping centers and other entertainment facilities are made available. Royal Phuket Mariana, another landmark tourism attraction, is scheduled to open in March there. Phuket hopes to attract more Korean honeymooners starting this winter holiday season. United Airlines has announced its decision to resume flights on Incheon-San Francisco route starting April 4, 2006 which has been suspended temporarily since September last year. Departure time at Incheon International Airport is 1:30 p.m for arrival at San Francisco at 8:13 a.m. local time on the same day. Returning flight from San Francisco, in the meantime, is made available at 1:17 p.m. local time for arrival at Incheon at 5:40 p.m. next day. The American air carrier will put Boeing 777 plane with 258 seats into the transpacific air service. The transpacific air service by the U.S. carrier was temporarily suspended in 1998 after Korea was brought under IMF bail-out package in the wake of the Asian financial crisis and 9/11 crisis. In September last year, it suspended the service temporarily again citing lower airfares against backdrop of surging international air fuel prices. "We are determined to continue our regular flight services from now on while tapping new tourist traffic to the United States," said an airline official. Package tour advertisements being carried in the newspapers turned out to be the most influential factor for Korean overseas travelers in choosing their final destinations and tour operators. 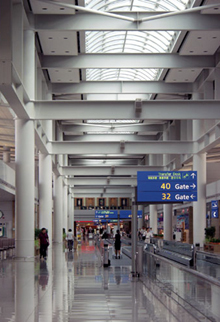 According to a survey conducted by the Korea National Tourism Organization (KNTO) on about 2,000 Korean overseas travelers selected on random at Inchoen and Kimhae international airports in March, May, August and October, 34.7 percent of respondents selected newspaper advertisement as the most influential factor behind their selection of overseas destination and tour operator as well. The ratio is comparable to 17.2 percent registered in 2003. When asked to pick up the major source of information about overseas travel, 39.5percent said they turned to travel agents. Noteworthy is that about 30.8 percent of respondents picked up Internet as their prime source of overseas travel reflective of ever increasing penetration rate of computer hooked up with broadband network in Korea. As to the prime object of overseas travel, 66.8 percent cited leisure and holidaymaking. Coming next were feeling of content (58.5 percent) and desire to visit the destination (54.8 percent) in that order. When asked to name which countries they have visited, China was the No. 1 with 34.7 percent followed by Japan (19.1 percent), the United States (7.6 percent) and Thailand (7 percent). As to the country they wish to visit in the future, Japan was most favored by the respondents with 28.3 percent.